Laminate flooring is a cheaper, more readily available alternative to solid wood flooring. Caring for a laminate floor is quite different than for a wooden floor. Through proper care and maintenance, a laminate floor can last for years and no one will know the difference between the beautiful floor gracing the interior of one house and the real wood floor complementing the interior of another. Ammonia may be one way help keep your laminate floor looking good. Sweep and dry-mop the floor. This removes tiny abrasive particles that can be stuck between the boards or in the grain. These particles can prevent your floor from shining like new by making micro-scratches in the surface of the flooring. The more often the floor is dry-mopped, the longer the shine will be preserved. Fill the bucket with water and add 1 tbsp. of ammonia. A 4 to 1 solution of water to vinegar can also be tried if the ammonia solution does not work as well as you would like. Never mop the laminate flooring with commercial wood shine cleaners. Dampen the mop and wring out most of the liquid. It is important not to allow liquid to sit on the laminate flooring. Water can leak between boards and cause them to expand, which will shorten the life of the flooring and also affect the shine. Mop the floor in the direction of the grain. This makes it easier for the mop to pick up particles that may have been stuck between the boards and in the grain. Remove all moisture from the floor. 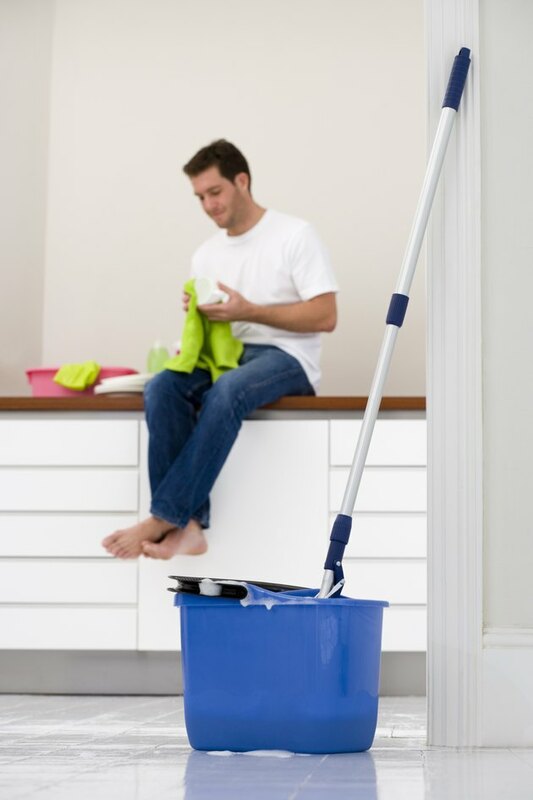 If the mop is too wet, wipe down each section of the floor with a towel or soft cloth. Spot-clean more resistant spots with small amounts of nail polish remover on cotton balls or Q-tips after the entire floor has been mopped. Based in Montgomery County, Md., Marcus Twyman has been writing professionally since 2008. Most of his work appears on corporate websites. Twyman specializes in business, home and garden and education topics. He is currently attending Montgomery College and is working towards a Bachelor of Science in nursing.